As the much-awaited G20 Turkey Summit in Antalya brought the most influential political leaders and business world together to focus on the most significant issues afflicting the world, the host city is to break the ice with the annual international piano festival. Running between Nov. 17 and 29, the 16th Antalya International Piano Festival will feature world-renowned international pianists, public concerts, master-class panel sessions, workshops, seminars and various other events. Under the art directorship of maestro Gürer Aykal, many international musicians including Don Davis, Christoph- Mathias Mueller, Hiromi, Saleem Ashkar, Hüseyin Sermet, Nikolai Demidenko, Gülsin Onay and Martina Filjak will be performing during the festival. This year's music feast will kick off with a concert by the Antalya State Symphony Orchestra which will be conducted by German maestro Christoph-Mathias Mueller. Following Japanese jazz pianist-composer Hiromi's performance on Nov. 20, Turkey's Hüseyin Sermet and the Borusan Quartet will take the stage a day later. 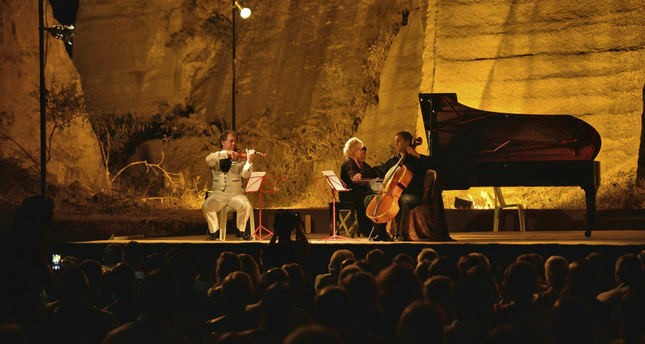 Ending the first week with Palestinian-Israeli classical pianist Saleem Ashkar's musical expertise, the festival will house the Mediterranean Philharmonic Orchestra on Nov. 23 who will play for the people of Antalya free of charge. The second week of the lineup will include internationally acclaimed Turkish musicians Gülsin Onay and sisters Ufuk and Bahar Dördüncü. Don Davis, best known for his work on "The Matrix" and "Jurassic Park III", will delight ears on the last day of the festival on Nov. 29 with a special gala concert marking the beginning of the 52nd Antalya International Film Festival. The international festival will welcome a total of 120 piano students, which is an important step for the development of music in Turkey. "This year's festival is very important because the events will be recorded on video. The audial recordings of the concerts will be broadcast live on radios around the world. These recordings will be passed down to the future and spread all over the world," maestro Aykal said. Apart from concerts, panel sessions and master classes organized as part of the festival, the organization put on by the Antalya Metropolitan Municipality will make a tremendous impact with the social responsibility projects that will be carried out throughout the event. The Antalya Metropolitan Municipality, which has initiated special projects for the disabled, will integrate young disabled people into the 16th International Antalya Piano Festival. Young disabled people who are trained at the Antalya Metropolitan Municipality Special Education Center will attend the body percussion workshops and have the chance to listen to piano recitals at the education center. The workshop, which will be held by Turgay Başar, will enable children to play games and work on their body music. The workshop will also feature seminars on the content of the workshop and how these trainings can help children to touch upon other people's lives. Following the three-day workshop, children will perform what they have learned at their schools. Tickets for the concerts can be purchased via Biletix.